Sirin Labs' Finney and HTC's Exodus blockchain phones priced high at $999 and are scheduled to be released by end of this year. They are expected to be expensive to match their upscale features. A new chunk of the smartphone industry is starting to flourish as the blockchain technology continues to attract more people to join the crypto craze. Two new blockchain smartphones from Sirin Labs and HTC are scheduled to be released this year. They are expected to be expensive to match their upscale features. Sirin Labs has officially taken the wraps off Finney, a $999 blockchain phone that features a dual-screen display. The second display is specially dedicated to cryptocurrency transactions. The so-called Safe Screen slides up from the back panel and runs on a separate firmware to ensure users of their transactions. Sliding up Finney's rear display will open the phone's cold storage wallet. Finney also runs on Token Conversion Service to make sure trading safely takes place. It runs on its own Sirin OS, a forked version of Android 8.1, and its own app store called DApp. Internally, the device is powered by a Snapdragon 845 processor, a 3,280mAh battery, 6GB RAM, and 128GB internal storage which is expandable up to 2TB. With Sirin Labs Cyber Protection suite, the phone's security is foolproof through three-factor authentication. And just when the industry thought HTC's back is against the wall, the Taiwanese electronics giant is making huge investments to release a blockchain phone later this year. "The first cold wallet phone with key recovery. Early access available in Q3." 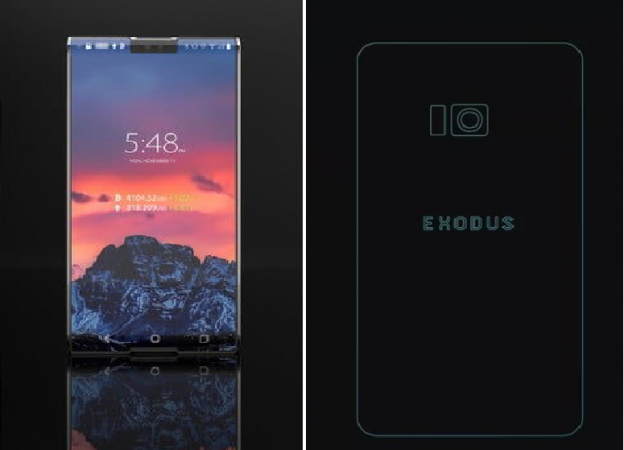 HTC has announced the Exodus blockchain phone since May and it is expected to cost around $1,000. Exodus will serve as a universal wallet for almost, if not all cryptocurrencies. "We envision a phone where you hold your own keys, you own your own identity and data, and your phone is the hub," HTC's Phil Chen told The Verge. Specs details are scarce at this point, but expectedly, it will be a powerful beast rocking a high-end processor and beefy memory and battery.